Meet Horizen – a privacy-oriented cryptocurrency and a leading-edge technology platform. The company is connected to many crypto-payment providers and is constantly adding more, encouraging mass adoption of their platform. Their sidechains will also enable anyone to build privacy-based applications, allowing them to bring thousands of real-life services to the world. I invited Horizen Co-founder Rob Viglione onto my daily tech podcast to learn more about their new flagship application, Sphere by Horizen. The product offers unprecedented features such as easy encrypted transactions, secure messaging between users, and the ability to toggle between light and full clients. 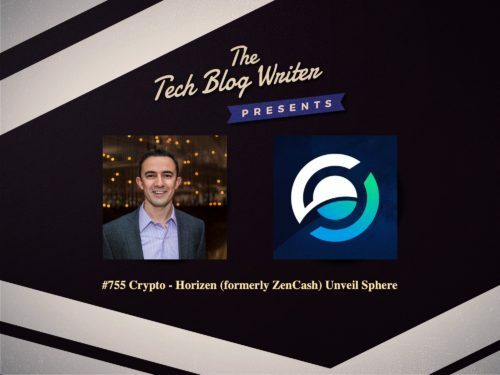 As the Co-founder of Horizen and President of the Zen Blockchain Foundation, he is helping to “Uberize” finance, create a freer, fairer, and nicer world by bringing fintech to the disenfranchised and pioneer decentralized blockchain-based systems of governance. As a PhD Candidate in Finance, his research interests span crypto finance, venture capital, and asset pricing. Rob also teaches “Bitcoin & Blockchain Applications in Finance” at UofSC, volunteer to help create startup societies with the Seasteading Institute, and is also advisor to the decentralized lending platform ETHLend, startup societies project, Blue Frontiers, next-generation cryptocurrency exchange, CryptoSouk, and to Hero Engine World, a blockchain-based platform, artificial intelligence, and real-time massive scale 3D modeling and scenario simulations to help SmartCities with Disaster Recovery and Emergency Management.